Western blot analysis of extracts from MCF7 cells, untreated (-) or treated with calf intestinal phosphatase (CIP) and λ phosphatase (+), using Phospho-Rb (Ser608) (D10F2) Rabbit mAb (upper) or Rb (D20) Rabbit mAb #9313 (lower). 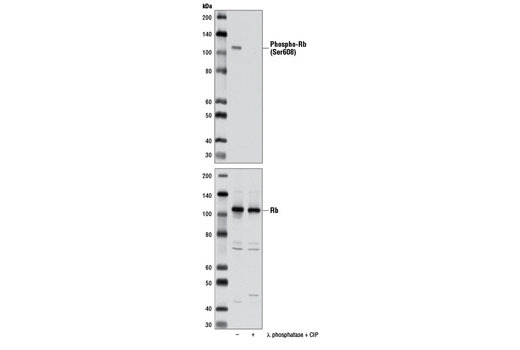 Western blot analysis of extracts from WI-38 cells, serum-starved for 3 days (-) or serum-starved for 3 days followed by treatment with 10% serum for 2 days (+), using Phospho-Rb (Ser608) (D10F2) Rabbit mAb. Immunoprecipitation of phospho-Rb (Ser608) from WI-38 cell extracts using Phospho-Rb (Ser608) (D10F2) Rabbit mAb (lane 2). Western blot was performed using the same antibody. Lane 1 is 10% input. 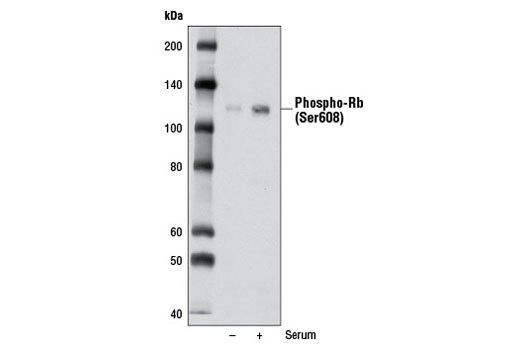 Phospho-Rb (Ser608) (D10F2) Rabbit mAb recognizes endogenous levels of Rb protein only when phosphorylated at Ser608. 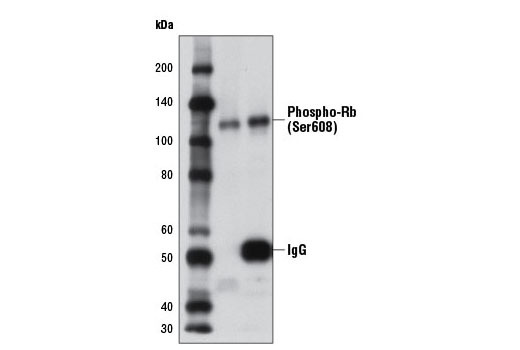 Monoclonal antibody is produced by immunizing animals with a synthetic phosphopeptide corresponding to residues surrounding Ser608 of human Rb protein.